Just finished these three knives. They are currently for sale at Gilger Gold Smithing on Main St downtown Ames, Iowa. They are hand forged out of 1084 high carbon steel. Hardened and tempered with the back drawn for toughness while leaving the edge hard to keep a good sharp edge. These will shave hair. They are meant to be used as every day carry or utility. 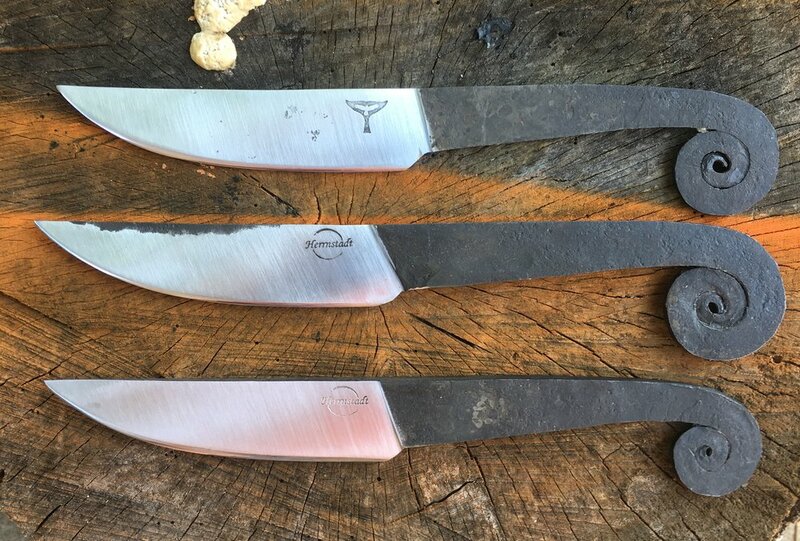 I will be demonstrating and teaching a workshop on low tech bladesmithing using these blades as a model in mid October at the Mathew Edel historic blacksmith shop, Haverhill, IA. Thanks to the Iowa Arts Council for a grant supporting my work and this workshop.